After a long hiatus, Supergirl is finally back on The CW. 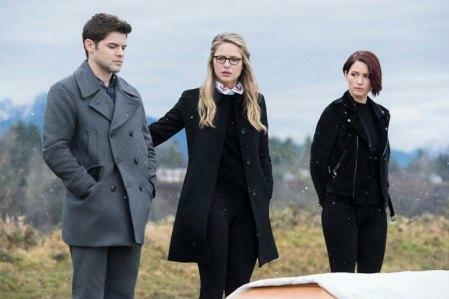 We’re returning with “Schott Through the Heart” (3×14), which appears to focus on Winn (Jeremy Jordan) and his family after his father’s death…but it doesn’t look like Supergirl (Melissa Benoist) or National City is safe from the Toyman. 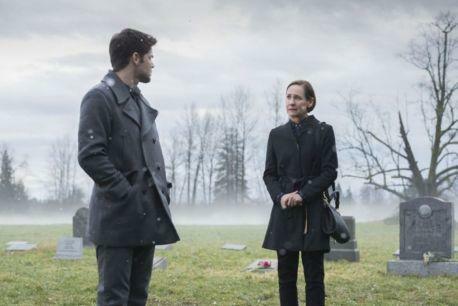 Laurie Metcalf joins tonight’s episode as Winn’s mother. It’s been a long nine weeks while DC’s Legends of Tomorrow temporarily took over Supergirl‘s timeslot. So, let’s recap and get ready for tonight’s episode. The last episode we saw before hiatus was “Both Sides Now” (3×13) in which we saw the DEO capture the second Worldkiller along with an increased need to fix the Legion ship. With this episode, we think there’s finally going to be a break on the Worldkiller front when the DEO finds the identity of the second Worldkiller, Purity/Julia Freeman (Krys Marshall). At first, it just seems like a woman, chilling out listening to music who gets scared and then morphs into Worldkiller mode. This opening scene was extremely dynamic in a lot of ways because it’s the first time we see and the team sees that a Worldkiller can be the person they lived their life as on Earth and then that the Worldkiller side comes out (but it’s very much doubted throughout the episode. The second thing that I loved was that we often don’t get to see J’onn (David Harewood) in the field using his powers and even though he used it to morph through the ice wall that Kara created to cuff Purity. There’s very much a division between the Danvers sisters in this episode, which we don’t get often…not to this extent, but it was good to see. It also very much shows us the very two opposite sides of Kara and Alex (Chyler Leigh). Kara is extremely hopeful and certain that there’s still good in Purity and that Julia is actually in there and that she can help her still. Meanwhile, Alex is very much the tough trained DEO agent who hunts alien criminals that J’onn molded over the years who is going to push and push for information. Though Kara believes that Julia is still in Purity, Alex won’t give in to that idea thinking that she’s just playing her sister (very much this is a reaction to the threat that the Worldkillers pose to her sister). There’s this cute sister-brother moment between Alex and Winn when he notices her freaking out and getting emotional (which we all know is something that Alex just doesn’t do, especially at the DEO in front of people who are not Kara and J’onn) and there’s this like two-second hug. I love this because it so enforces the family that’s formed and how Winn’s gotten to be a lot closer to Alex as well, not just Kara’s friend. This all comes before Purity escapes and starts to rampage through the DEO in search of her Kryptonian crystal. I was personally hoping for Alex to get injured, but then she injured her leg not long ago and had it helped along by Legionnaire technology. During all of the insanity at the DEO, J’onn’s busy counseling Mon-El (Chris Wood) after seeing that there’s obviously discourse between him and Imra (Amy Jackson) while he and Winn were trying to help jumpstart the Legion ship using a part from J’onn’s spaceship car. We find out more about Mon-El and Imra’s backstory, which I appreciated. It was nice knowing more besides the fact that Mon-El grieved Kara for so long, but that their marriage was in order to unite planets not out of love (that came later). Reign (Odette Annable) is activated in the middle of Sam’s mental health day with Ruby (Emma Tremblay) out ice skating, leaving Ruby freaking out that her mom’s disappeared. Lena (Katie McGrath) comes to Ruby’s rescue, promising that they’ll figure things out. While Purity is out on a rampage in a subway system, the DEO goes to try to take the Worldkiller back in and save as many lives as possible. During this, it’s the first time that Kara and Alex both fully see that Julia can emerge from the Purity Worldkiller persona. This changes both of their views and we finally see the Alex in this scene that we all know and love. Though Mon-El and J’onn (as Martian Manhunter) were both there to help…they weren’t able to take Purity back. In fact, we have Julia giving herself up to Reign in order to save Alex and Kara. This is what spurs a new mission, not to defeat the Worldkillers but to save them. Winn is able to work with Imra in order to fix out the issue with the Legion ship drive, figuring out a small math issue that was screwing everything up. Mon-El and Imra talk and things seem to be better between them, but we’re left with Imra telling him that it’s time to tell him why they’re really there…so hopefully, this is uncovered in tonight’s new episode. The Danvers sisters end the episode with a heart to heart about their broken hearts and giving up hope. I feel like as much as Alex attributes her actions in not seeing Purity as Julia to having lost hope, that so much of it is also because of her fear of losing Kara after what Reign did to Kara in “Reign” (3×09). Finally, we see Lena and Sam arguing about Ruby after Lena reveals that she just tried to reassure Ruby that they’d be able to help her mother and that Ruby already knew that there was a problem with her mother. Reign flashes to the surface for a moment and when Sam comes back feeling like she’s blacked out, Lena assures that she knows what’s wrong and that she’s going to fix her. Now, I don’t really think Lena actually knows that Sam’s a Worldkiller, but it’ll be interesting to see where Lena goes with this and if it actually helps or makes things worse in the end. We’ll continue to see new episodes of Supergirl on Monday nights from tonight until June 18th. Are you excited that we’ll get some more background on Winn and his family? What are you most looking forward to with the rest of season three? Let us know below!